* 50MHz to 13.5, 20, or 40GHz frequency coverage. * New processor makes measurements and data transfers up to seven times faster. Fast-sweeping, built-in synthesized source. 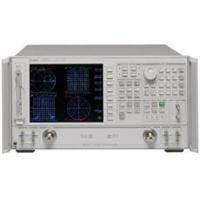 Integrated solid-state switching S-parameter test set. Vecter receiver, error correcton, time domain. Up to 105dB dynamic range.